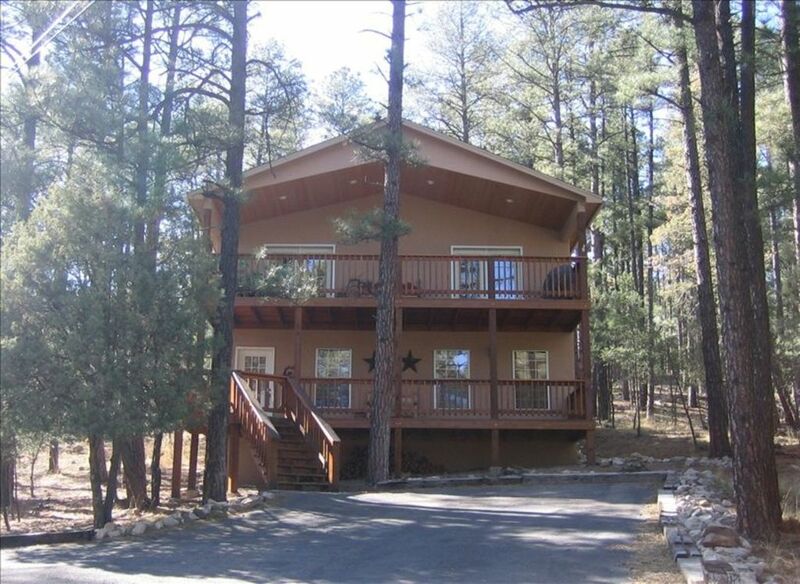 Cozy Pines is located in Alto, NM and is a great place for that tranquil mountain get away. Surrounded by tall pines and only a 300 yard walk to Alto Lake, makes this location ideal for watching and feeding the wildlife. Enjoy nature from any of the three decks. A very close distance to the Ski Apache turn off, the quaint shopping area and Ruidoso Downs race track are only ten minutes away. This air conditioned, two story mountain home comfortably sleeps ten and has all of the amenities to make your stay comfortable and enjoyable. There are four spacious bedrooms all with cable TV. The three bathrooms includes a beautiful master bath with a separate jacuzzi tub and shower with dual heads. The living/dining/kitchen are open making it ideal for any gathering. It includes a big screen TV with DVD, wood burning fireplace, fully equipped kitchen and gas grill. The game room has a pool table, electronic dart board and plenty of family board games. We have wireless internet / dsl connection, so bring your laptop or ipad. For rentals from 5 to 7 days, we can provide a guest pass to the Alto Lakes Country Club where you can enjoy swimming, tennis, fitness center, dining and golf. Call for details. If your group includes small children, let us know. We have a pack and play, high chair, bed rails and stair gate available for your use. For more information, call Carol at either of the phone numbers listed below. Cabin Has a High Chair, Bed Rails, Pack N Play and stair rail for Renters Use. Absolutely fantastic cabin close to the ski resort! This cabin was fantastic! The location and proximity to the ski resort could not be any better. It was very clean and equipped with everything we needed. We slept 9 comfortably! I would recommend this cabin to anyone and we will definitely rebook if we decide to come back next year! Five stars! Very well taken care of!! This is “hands down” the best cabin that we have stayed at! It was very warm and accommodating. The owners have taken care of their home and it shows!! I highly recommend it! Beautiful ! Perfect place to stay ! A beautiful, spacious, and cozy house that captures you from the moment you arrive. This house is perfectly nestled among the pine trees. Sitting out on the balcony and the front porch allows you to enjoy the view of the lake as well as the snow capped mountains. Inside the house is beautiful. The master bath with a 6 foot shower and a whirlpool tub and huge bedroom with a walk-in closet is fit for a king and queen. The other bedrooms were big and the bathrooms were excellent. One of the bedrooms led to another balcony to the back of the house. The kitchen was given a heavy work-out and it survived. There were nine of us on this trip and it seemed someone was hungry at all times. We were able to sit together as a family during our meals which was made possible by a table that sits 6 and an island with stools next to the table. Walking from the kitchen right out to the balcony we were able to fire up the grill and watch as the deer came by to pay us a visit. Downstairs has a pool table which brought out the competitive spirit in us all. We have wanted for several years to spend Christmas together as a family in the mountains. As you all know it is difficult to make schedules work for everyone. This became a bucket list for my wife and I, so we began to pray that God would lead us to the right place for this to happen.God led us to this location and we are so grateful. This place made us feel right at home. We are so pleased that you and your family had a great holiday together in our Ruidoso home. We picked this home primarily for it's location and some of the pictures we found on the site. We could not have picked better and must stress that the pictures do not begin to capture how truly lovely the home is. It's really beautiful inside and out. Beds were very comfy and the tv's in every room were a bonus. And the access to the lake is amazing. Just so close. My son and nephews were in heaven; rock skipping for days. Carol was extremely responsive leading up to our stay. We would stay here again in a heartbeat. The house was great and in good working order. Everything in the home was as described. We stayed here with our kids and my sister in law's family. Plenty of room and the pool table is a nice addition. Alto Lake is approximately 300 yards from the cabin.